We recently completed a brand new WordPress website for Niskayuna NY based Medetec Consulting Services Corporation. 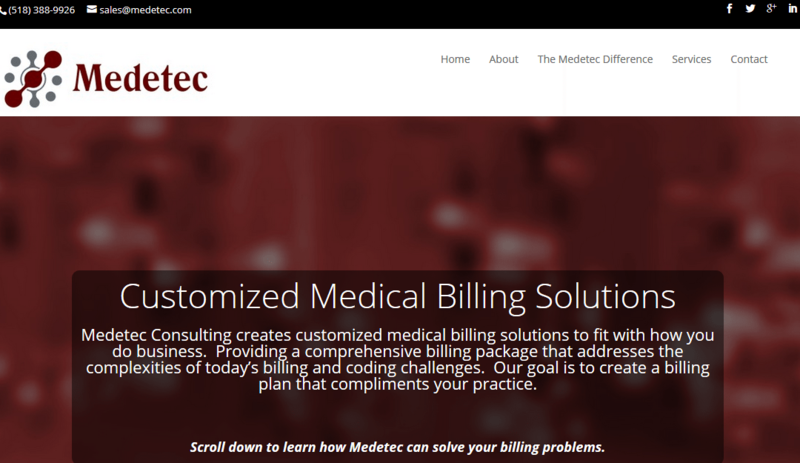 Medetec provides medical billing services to healthcare practices in New York state, particularly in the capital region. It is a woman-owned business; its principal is Amy Piper. The website theme is Divi, from Elegant Themes. The site is responsive, meaning that it responds and displays appropriately for screens of all sizes. We like Divi (and Elegant Themes). For many small businesses, it makes economic sense to develop an “off the shelf” theme rather than have one built from scratch. In the case of Divi, it’s so flexible it’s almost like building one from scratch (except without the hassle!). Design elements, such as color, were taken from Medetec’s existing logo; we did limited graphic work on site. The site was optimized for search which, first and foremost, means developing a site that works well for site visitors. It should be fast and easy to navigate. We also helped Medetec to establish very basic accounts on mainstream social media services, such as Facebook, Google+ and Twitter. These accounts are critical as evidence to search engines that the business is for real, as most mainstream businesses will have such social accounts. In many respects, business social media accounts act as calling cards and may be considered entries on local online business directories. Importantly, the social media assets are branded in a manner consistent with the website. We wish Amy and her Medetec team much success as it grows!